Salmorejo is a cold soup originally from Cordoba (Andalusia) in the south of Spain, not far from where I live. 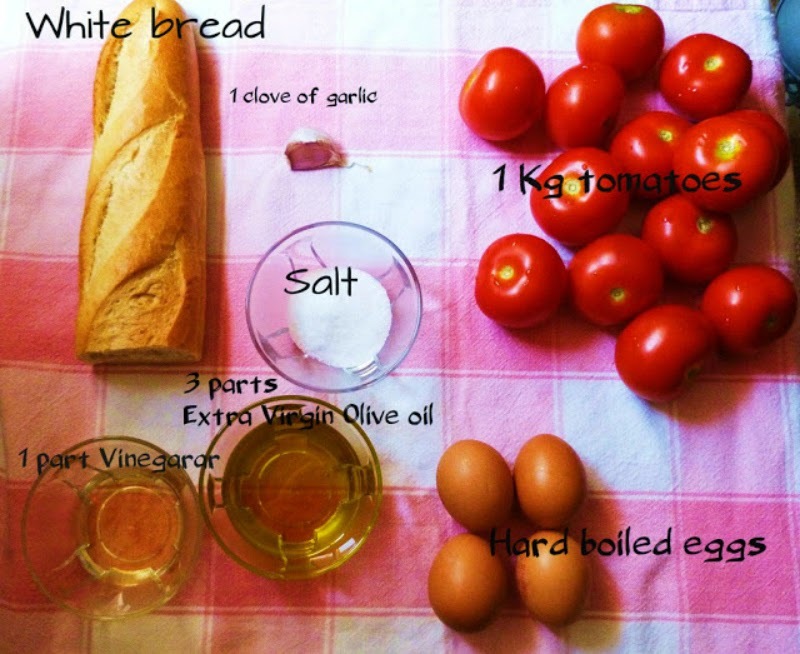 It is made from bread, tomatoes, garlic, salt and vinegar ( no water added, just the juice of the tomatoes). I make it following the traditional recipe used by the working men in the fields during the hot summers. Liquidise and add a hard boiled egg yoke for extra creaminess. Se te olvidóel scharle jamoncito picado por encima. Qué ricura!!!! Como apetece en verano eh? Delicious soup, as I clid yesterday too tomato with bread, eaten in my tomato soup with noodles or rice. I have never had this before. That looks really good. I have to try this once our tomatoes are finally ready and ripe. Hmmm... yum! :) Thanks for sharing. delightfully fresh and vitaminic!, I'm used to make it too, but I like to add some green pepper to the mixture! You're making me hungry! 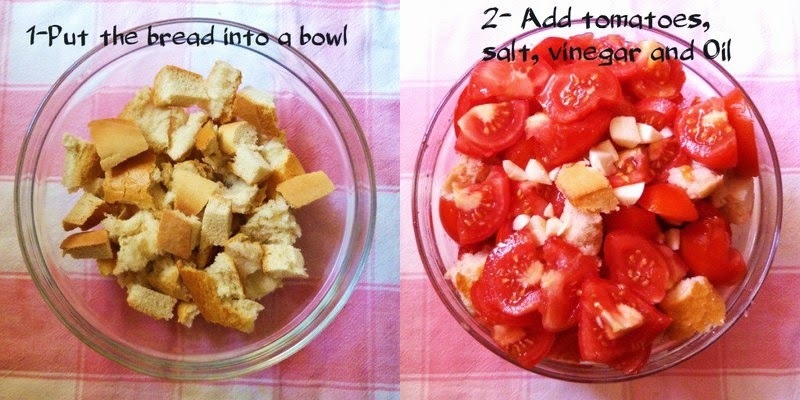 Sounds easy to make, beautiful to look at, and healthy too. mmmmmm, but of course it requires the freshly grown tomatoes of a sunny climate such as yours. No hope of that over here at the moment! So I'll feast my eyes on this instead and try to imagine how it smells as it is served. Como me encanta el salmorejo!! Pero nunca he enterrado como esta cocinado. Gracias guapa para la receta! Mmmmm so yummy! I haven't had breakfast yet and now I want this! That looks delicious. Im a huge fan of tomato anything. Especially these days. I will try it and give you my review. I'm pinning this to my recipes folder! I love gazpacho so I think I will love this one too! OMG! All of my favorite foods wrapped up in one soup? Amazinggg!! Me parece delicioso....Have a beautiful sunday Sacramento! ps. Ohhh ya el futebol...it's a big day for Spain right? los deseo suerte! oh,gracias, muy delicioso!!! mil besos! It looks so delicious. I'm very hungry now. I want to try it! Do you chill it? People in the fields did not have the possibility to do it I presume. Looks and surely tastes great. Solo porque no tengo suficientes tomates si no lo hacía ahora mismo.. no sabes como me gusta .. quiero ir a visitarte... podemos? Yummy!!! Tengo que intentar eso también.... vaya la lista se va alargando... un besote, mi reina! 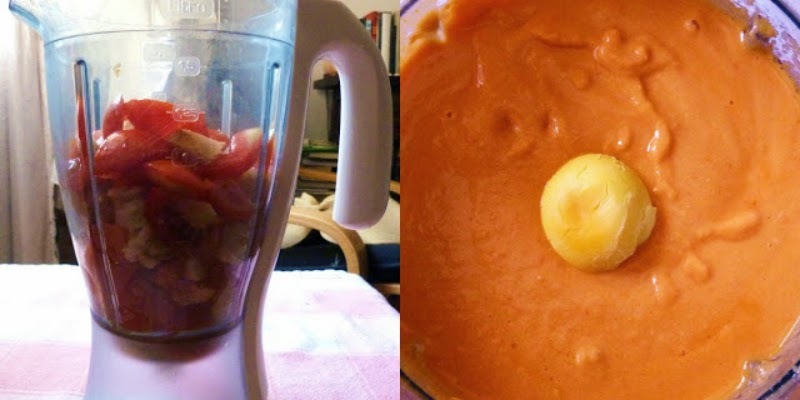 Ay, con lo que a mí me gusta el salmorejo! El que hace mi madre está tremendo, me tengo que controlar porque me pasaría el verano a base de salmorejo nada más. I am making the soups this week! It looks amazing. I just need some flavorful tomatoes. Thanks so much for the recipe. My 12-year old daughter and her friend just made it, it was delicious! Normally they're not too happy with vegetables, but they loved this! I'll post pictures in my next blog post! Looks delicious! I have to make this for my son today. All the ingredients are easy. I love this! Love to you my dear friend! Me encanta, hoy mismo lo he comido. MMmmmm looks so so so so so good!!!! Ayyy que nunca lo he probado... 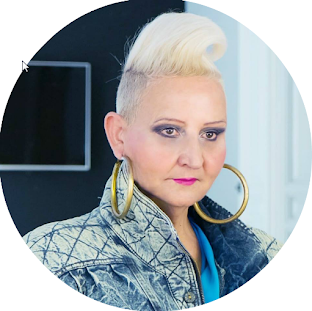 Lo preparo hoy, y te cuento. Uyyy, nunca l eh provado, pero se mira tan delicioso.